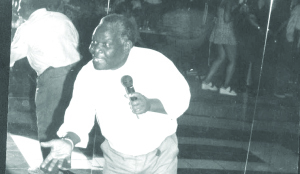 •PETER ‘Tsotsi’ Juma, Sugar Daddy number One, mesmerising fans at a night club in Lusaka. JUST to mention the name of Peter Tsotsi Juma evokes old memories of other Zam-rumba legends such as Nashil Pitchen Kazembe and Benson Simbeye both of whom were household names on the East African music circuit during the early 60s up to the late 1970s. It was not just the name that mattered most but the music as well, which has continued to inspire the old and the young, decades after the passing on of this controversial Zambian music legend commonly known as ‘Sugar Daddy’ number one. Peter Juma who derived his middle name ‘Tsotsi’ from another folk great of the 1940s, Stephen Tsotsi Kasumali, cannot be outdone in as far as Zambian traditional music is concerned and the fact is that, he contributed greatly to popularising Zam-rumba whose relics were similar to those of Nashil Pitchen, Fire Family, Uweka Brothers, Max Mwansa and the Black Power Band, Saiga Daka Band, Kalombo and the Malaika, Masiye and Uweka Brothers among them. Tsotsi Juma was a folk teller and social commentator who sung mostly traditional love songs based on some of the women he loved most, spiced with humour such as in songs like, Muka Muchona, and Sweet Namutowe, for example, which the Madalas (elderly men) liked to listen to. The Muchona man, as he was nicknamed after spending many years in East Africa, Tsotsi Juma is no stranger to the very foundation of Zam-rumba music. He is of the same breed as Benson Simbeye of the Uwambeyele Ulukusu (Mumpanga Nshakamulabe) fame, Pitchen Kazembe, John Mwale and East African greats like Congolese star Awilo Longomba’s father, Lovi Longomba, Gabriel Omolo and Adolf Anyoro, only to mention but a few, whom he mingled and produced music with. Tsotsi Juma’s message in his music drove home a point that was worth learning a lesson from. He was a good and enticing dancer, always shaking his big tummy whenever he was performing, much to the amusement of his fans. Born Peter Juma Fwambo at Chipyola Village in Chief Tafuna’s area in Mbala District in 1932, he went to Chipyola Primary School for sub A and Standard Two, before going to Mbala Primary School to attend Standards Three and Four. But the desire for music swayed him away from school and dropped out in the early grades. He thereafter taught himself how to play a home made three-stringed instrument called banjo and later mastered the actual guitar. Tostsi Juma played traditional music at many village functions and other social gatherings. In 1949, he crossed into Tanzania where he landed a contract with that country’s producer, Peter O. Kanindo, popularly known as P.O. Kanindo, under the Sungura label and did a few songs. When things did not seem to go well with him, he decided to trek to Kenya a few years later to seek greener pastures. While in Mombasa in 1962, he met his fellow Zambian compatriot Nashil Pitchen Kazembe, with whom he formed the Congo Kids band before changing the name to Congo River Kids, after returning to Nairobi. The same year, the band signed a contract with Equator Sound Studios and released Swahili hit songs like Ewe Malaika, which was also re-issued by the Jumbo Boys and also Zailai Zailai, Taxi Driver, Jufunze Mengi, Unavyosema and Wewe Jane. But in 1970, Tsotsi Juma, Pitchen and some Congolese musicians, left to form the African Eagles Lupopo Band which was well received across East Africa and Zambia. The Eagles Lupopo Band went into the studios to release Comrade Kaunda, Mwapoleni Bane (Mwe bena Zambia) and Namutowe. Tsotsi Juma and Pitchen were inseparable, always hanging around each other, either relaxing or sometimes loved taking a walk on Lusaka’s Katondo Street, up to the last minute of their lives. Tsotsi Juma also did a duet with Pitchen on songs like, Bush Baby, Twist, Tamaa Mbaya, Nkumbuka Adija, Mulofa Moja (Poor Fellow). He also recorded Nafwa Mayo, One Zambia, One Party, Blue Zambezi, and Emi Nitakufa Nae, in which he had great influence. To Tsotsi Juma, Kenya became more than his home and married a Kenyan woman named Margaret Njiru, with whom he had five children, three girls and two boys. But things became tough in Kenya and after divorce, he came back to Zambia in 1980 with James, one of his sons. It was also a well known fact that Tsotsi Juma had several children from other women as revealed in the then Zambia Broadcasting Services (ZBS) radio interview with Timmy Mvula shortly after he returned from East Africa. He was asked if he was going to re-marry and whether he had other children else where, to which he responded: “Aah! Children? I have bandulo, I can’t count them,” meaning, he had plenty of them. In 1981, he signed a deal with Teal Record Company in Ndola and produced his hit song, Muka Muchona, which established him as a great composer of all time. Other songs which made him popular were, Tyson, Sweet Namutowe, Namishanga, Bashi Chanda (Njebeniko Njishibe Ichishinka), Chisenga Lumbwe (Uwafuma ku bu Soja), Mwilaupa Impali, Chonto, Nalumbwe, Bwesheni Mayo (Ndefuluka Mayo), Agness and Umwaume Tachepa, among them. 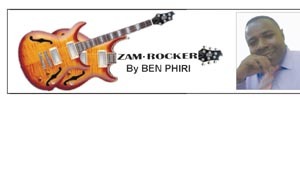 During the 1990s, the tide grew strong against the Zambian music industry forcing old musicians to wane. Firstly, the emerging bubble gum music mainly Kalindula and hip-hop, over shadowed Zam rumba, and secondly, the loyalties were too meagre to sustain musicians. His son, also a musician, was swayed back to Kenya by his mother thus, losing contact with all members of his family. Tostsi Juma, who lived in Lusaka’s Mtendere Township, re-married in 1986, but was too broke to sustain his marriage forcing his wife to walk out on him. His last chapter was not the very reflection of his great past when he ran businesses in Kenya. He ended up a pauper, scrounging around for survival in various places and on streets of Lusaka, sometimes getting help from some of his dear fans. It was not very pleasant as challenges abound from all sides of his life and finally lost hope. He went to Kabwe in 2000, to stay with his relatives and it was while there that a bout of malaria subdued him. Tsotsi Juma was admitted to Kabwe General Hospital where he succumbed, leaving his fans and contemporaries hopeless. It was hard to believe the path on which this great legend had taken, leaving behind his legacy for the young to explore. Peter Tsotsi Juma was as great as his music exploits.